Paul Joseph Goebbels, often shortened to Josef Goebbels, was a close friend of Adolf Hitler. Unlike with some other Hitler cronies, this relationship lasted until the day both men died. Joseph Goebbels shaped the propaganda of the Third Reich, and it was quite effective. 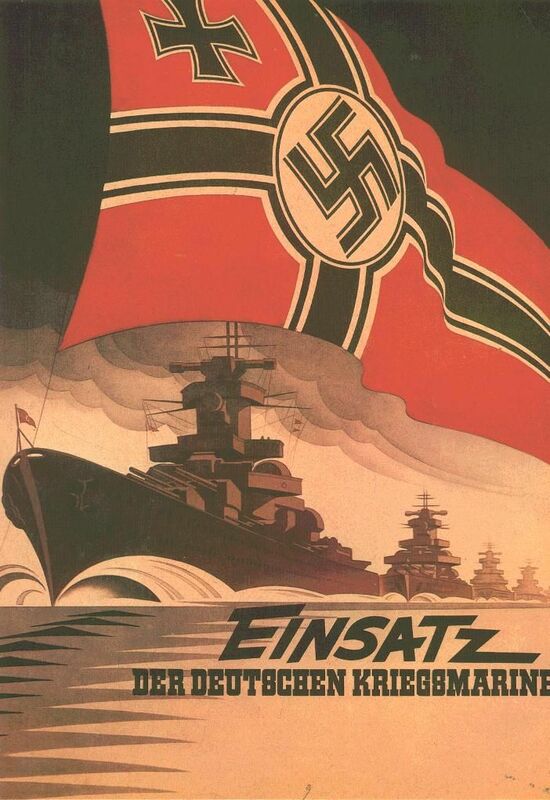 "The German Navy in action." 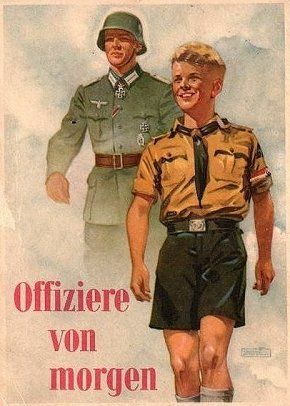 Goebbels was a good student, and graduated at top of the class at his Gymnasium (roughly, high school). He went on to study literature in various colleges, and earned his doctorate at the University of Heidelberg in 1921. Thus, he is known to history as Dr. Goebbels. Goebbels may have had his doctorate, but what he didn't have was a job. He wrote for the local newspaper and dated a Jewish girl, Else Janke. Goebbels tried to become a published author, writing plays and novels, but was unsuccessful. He took a series of odd jobs to support himself, including as a bank clerk and a runner on the local stock exchange. Throughout the 1920s, he read the classics, such as Dostoyesvsky and Spengler. He became interested in political philosophy, and early on showed a marked anti-Semitism. "Behind the enemy forces: the Jew." Goebbels was one of Hitler's few true cronies who met him after the 1923 Munich Beer Hall Putsch. Hitler tended to venerate people like Heinrich Himmler and Hermann Goering who had marched with him that day in Munich, and Goebbels was not one of them. This seemed to give Goebbels a slight sense of unease throughout their relationship, and he was notable for extravagant displays of loyalty that the others found ostentatious and overbearing. Goebbels joined the Party (NSDAP) in 1924, and was number 8762. This wasn't a particularly impressive number, to be one of the early birds you would want as low a number as possible, certainly below 1000. Some other bigwigs had relatively high numbers, too, but "traded down" over time when early Party Members passed away. Things like your party number were very important in the Third Reich, and even when you got a new, lower number, people (or at least rivals for power) remembered. This also probably contributed to Goebbels' sense of unease. Hitler recognized that Goebbels was educated and spoke well. Such men were necessary in the Party, which otherwise was largely composed of uneducated roughnecks. Hitler had Goebbels give some speeches shortly after Hitler got out of Landsberg Prison, and Goebbels showed a talent for giving them. Naturally, all this depended upon absolute and complete loyalty by Goebbels, which he gave at every opportunity. "This hand leads the country." In August 1926, Hitler appointed Goebbels to be Gauleiter (party boss) of Berlin. It was a very prestigious posting, and Goebbels had control over everything. He reorganized the party there, including finding new ways of raising money. This included charging for admission to Party events. 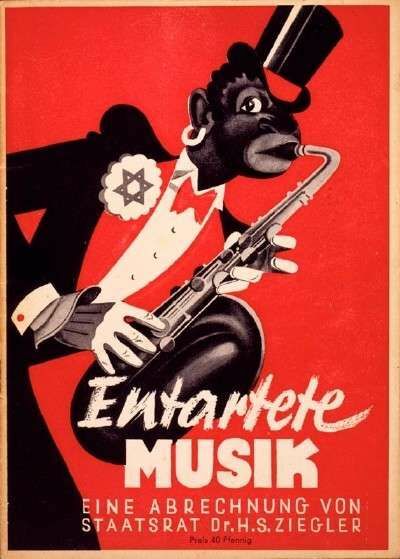 In order to drive demand to these paid events, Goebbels studied advertising techniques and began creating posters. 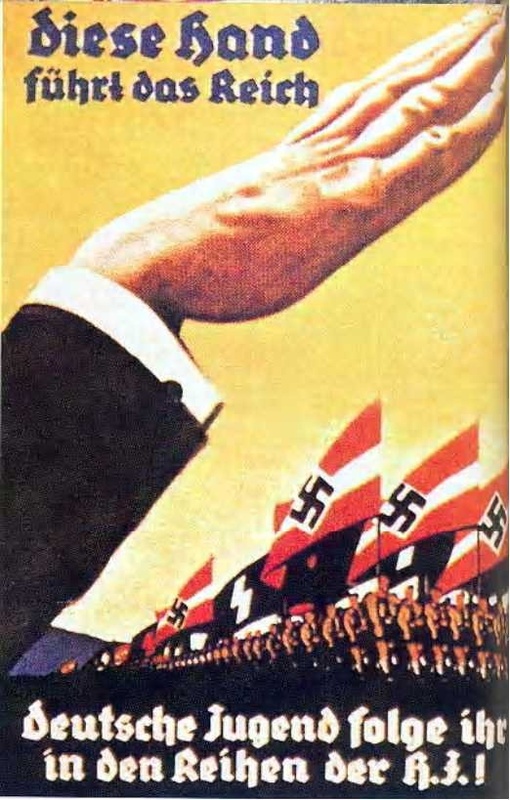 Among Goebbels' innovations were the use of large type, red ink (which was distinctive and also reflected the Party colors), and the use of general slogans that invited the reader to wonder what was meant by the phrase in question. Often, but not always, there was an explanation in much smaller type that drew the viewer closer to the poster and made for a more intimate relationship. "Degenerate music." (Promo for a pre-war exhibition of decadent culture). Not everyone was a fan of Goebbels. 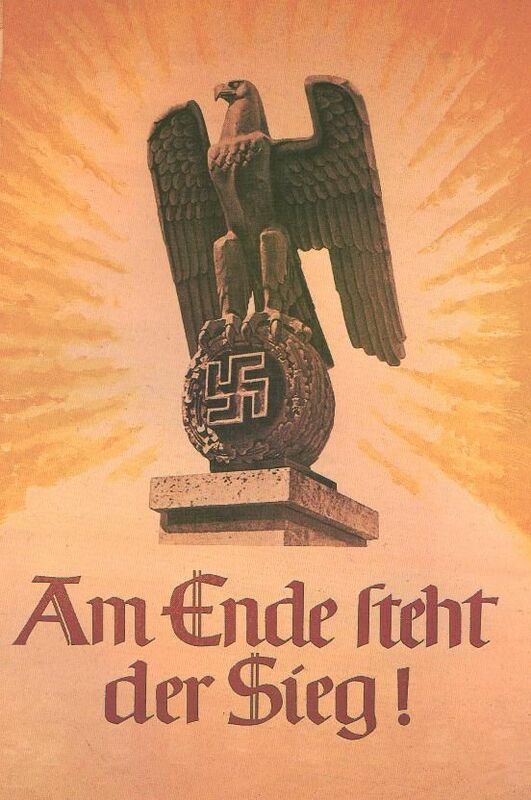 Early NSDAP member Gregor Strasser, for instance, was the official Party propaganda chief and thought that Goebbels' posters were not working in the cities, where people tended to be more educated and were not taken in by simplistic slogans. 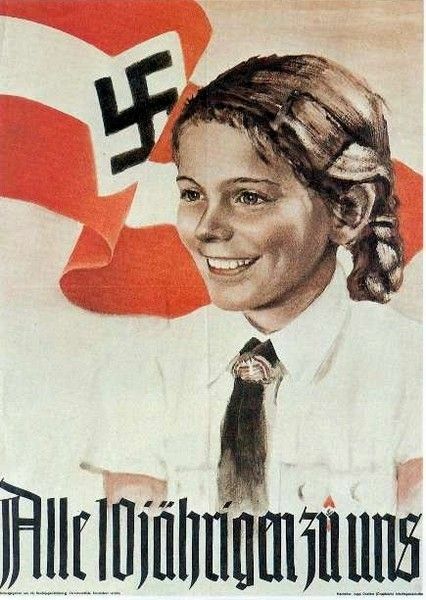 However, the posters proved extremely effective in rural areas, justifying Goebbels' techniques. 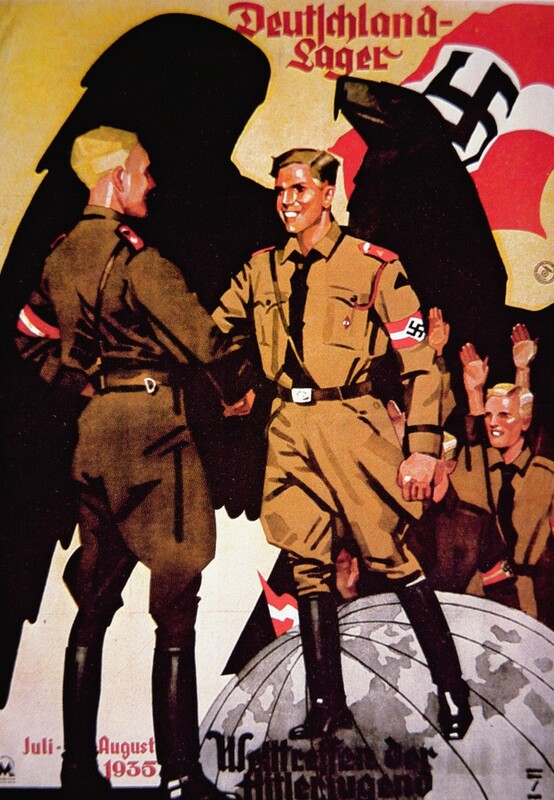 Goebbels took propaganda opportunities when they presented themselves. For instance, a local SA leader, Horst Wessel, was shot by two communists in 1930. While normally such an incident would pass almost unnoticed, Goebbels elevated him to the status of martyr. Goebbels went so far as to turn a very clunky marching anthem favored by Wessel, "Raise the Flag," into the official Party anthem. 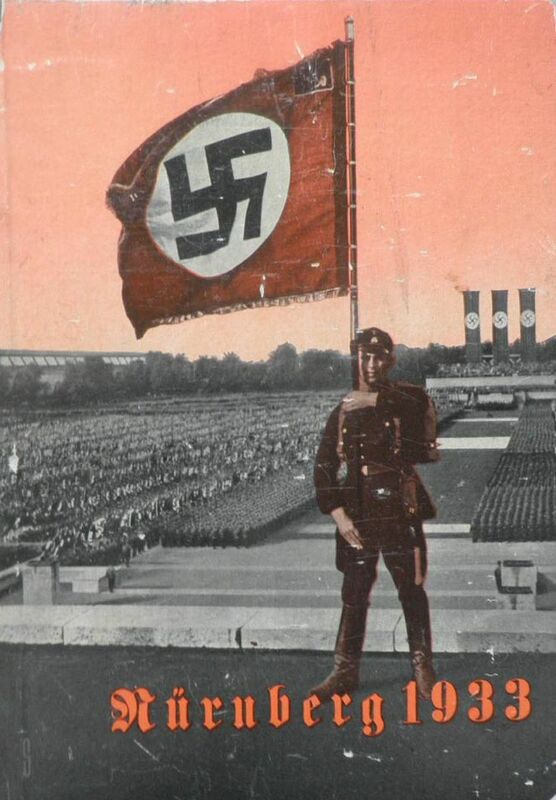 The name Horst Wessel became one of the most recognized in Germany throughout the Third Reich even though he had been nobody special, and all due to Goebbels' propaganda. 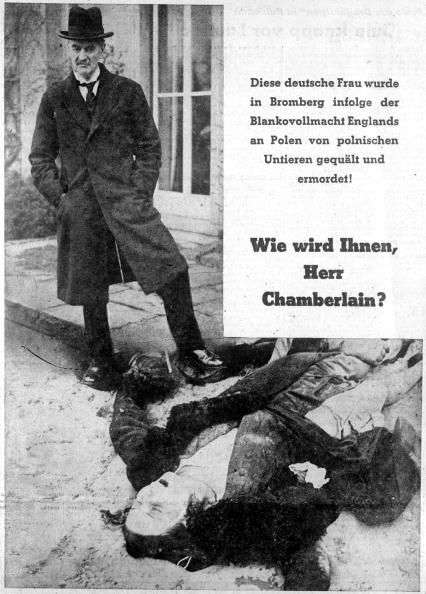 "This German woman was tormented by Polish beasts protected by the British. How do you explain this, Mr. Chamberlain?" Gregor Strasser and his brother, meanwhile, were pushing their luck with Hitler. They viewed Hitler as just another follower who had come along after the party was formed. 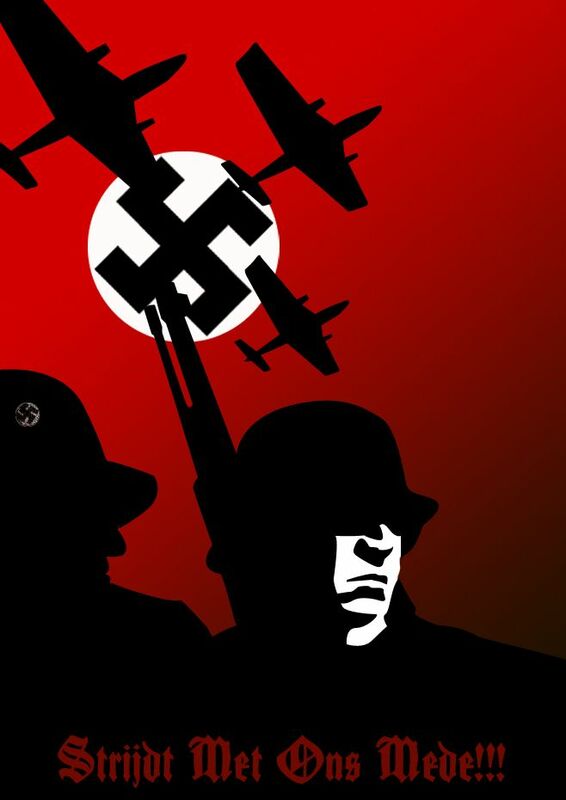 The Strassers began veering off into a different direction from Hitler, and even began publishing a newspaper in Berlin that was independent of Hitler, with different ideas. Hitler always viewed internal dissent as more dangerous than external, so he replaced Strasser as Reich leader of propaganda with Goebbels. 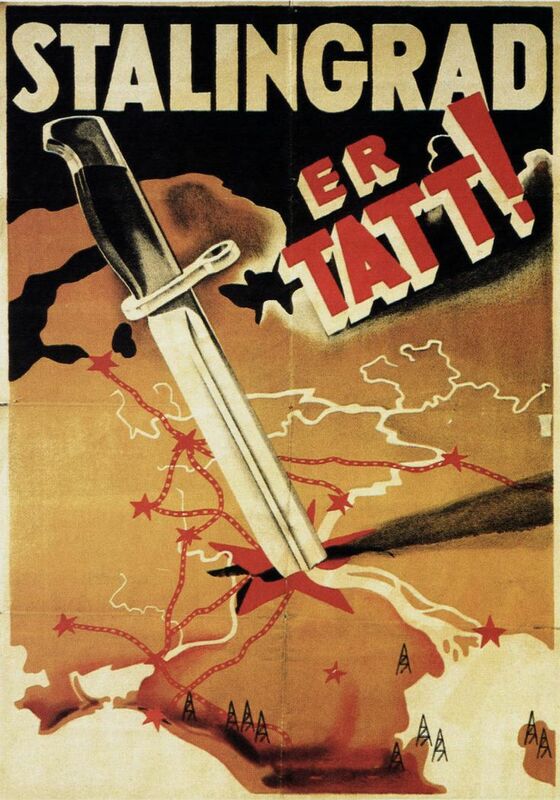 Goebbels promptly banned the Strassers' newspaper, and the Strassers, miffed, left the Party (Strasser was among those eliminated in the 30 June 1934 Night of the Long Knives). It was the time of the Great Depression, and scapegoats were needed. 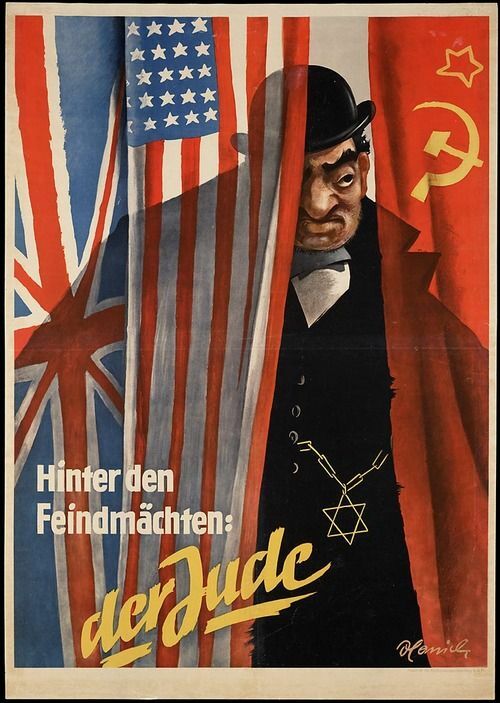 Hitler had to garner public support one way or another to win elections, and Goebbels began focusing more on the Jews as the cause of Germany's problems. He began emphasizing phrases such as "Jewish wire-pullers" and "International High Finance," an obvious code for Jewish bankers. Naturally, this all fit into Hitler's philosophy as set forth in "Mein Kampf," and it appealed to a certain subset of the population. 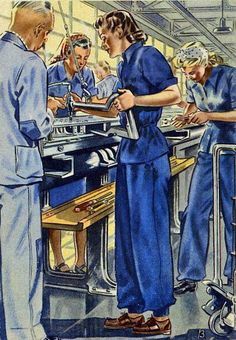 Propaganda encouraged women to join the Labor Service. Hitler's accession to the position of Reich Chancellor on 30 January 1933 was a turning point for everyone, including Goebbels. Goebbels engaged in one of his customary showy displays of loyalty to Hitler by organizing a torchlit parade through Berlin by some 60,000 SA and SS men. However, Hitler was not yet fully behind Goebbels, and did not appoint him to the Cabinet. This no doubt increased his sense of unease about his standing within the hierarchy. Events were moving quickly, however. The 27 February Reichstag Fire, followed by the 5 March election which was not quite as impressive as Hitler had hoped, suggested that propaganda efforts needed to be intensified in order to shape public opinion and take advantage of events that could inflame the masses. Accordingly, Hitler, using his authority under the Enabling Act, created the position of Reich Ministry of Public Enlightenment and Propaganda on 14 March for Goebbels. This was the main post that Goebbels held for the remainder of his life. Goebbels set up shop in the 18th-century Leopold Palace near the Reich Chancellery. It was handy for gaining quick access to Hitler across the street. Goebbels quickly went to work to increase party support among the masses, though no more elections were held. 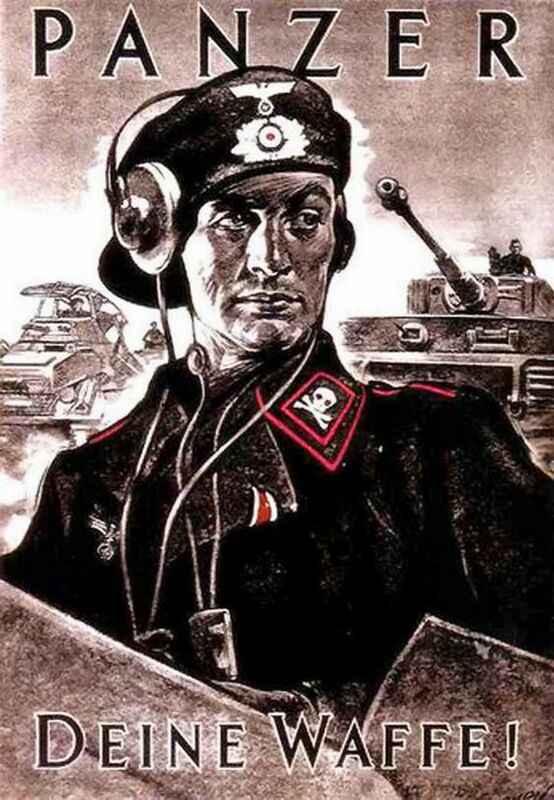 Since there were no longer elections, there was no quantitative way to know how well Goebbels' techniques were working - which no doubt suited him just fine. 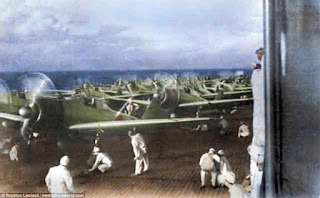 "The inhuman crimes of 'gangster pilots' will forever bar the United States from civilized society." Goebbels intensified his persecution of the Jews. He quickly drafted a Hitler decree authorizing a boycott of Jewish businesses. When Hindenburg died in August 1934, Goebbels broadcast that Hindenburg's position as President and Hitler's as Chancellor were now combined. 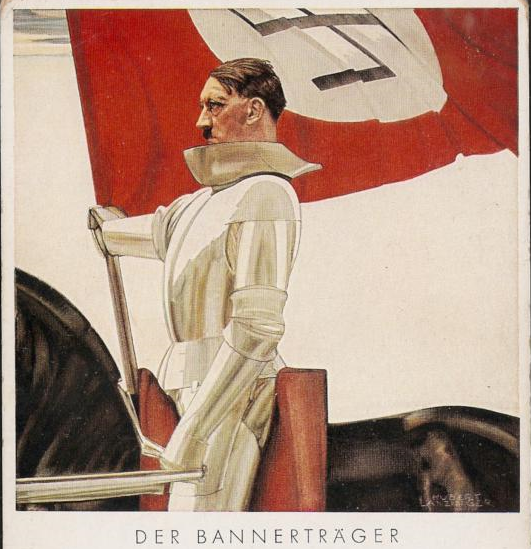 Hitler was now titled Führer und Reichskanzler, or Leader and Chancellor. 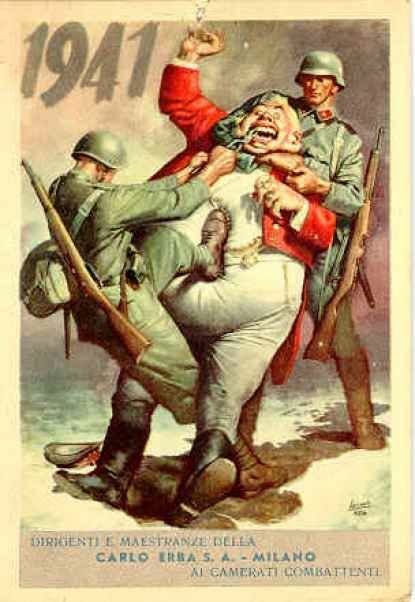 A 1940 Italian poster showing the Germans kicking the British John Bull character. Goebbels was a philanderer, routinely cheating on his very loyal wife, Magda. Rumor had it that Hitler himself liked Magda Goebbels, and prevailed upon Joseph to marry her to keep her nearby. Thus, Goebbel's cheating on the little woman (who managed to produce six offspring anyway) was frowned upon by Hitler, who did not want his minions' attention straying in other directions. As the years passed, this disharmony caused Goebbels a great deal of anxiety. To deflect attention and once again show his utter loyalty - which was the one thing that Hitler required above all else - Goebbels organized Kristallnacht on 9 November 1938. Goebbels also ramped up the propaganda campaign against the Jews in general. This restored Goebbels' place of favor within Hitler's inner circle, to the consternation of others who resented Goebbels' ability to cause problems and enhance his own position via his control of public opinion. Some people date the beginning of the Holocaust to this spurious act by Goebbels. 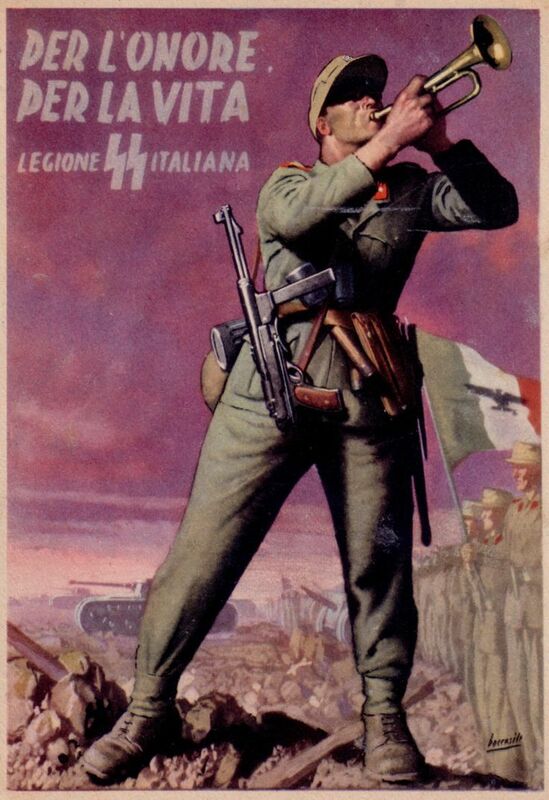 Posters encouraged Italians and citizens of other German allies and conquered lands to join the German military. "For honor, for life." 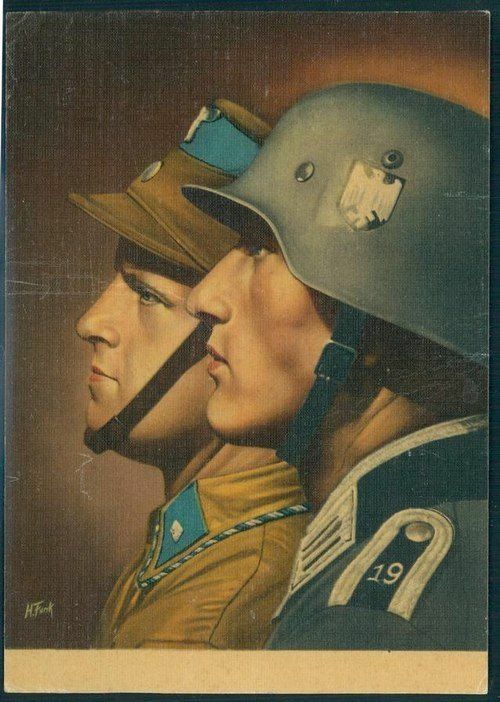 As the Third Reich spread across Europe, so did Goebbels' propaganda. Different propaganda efforts were created for different countries. 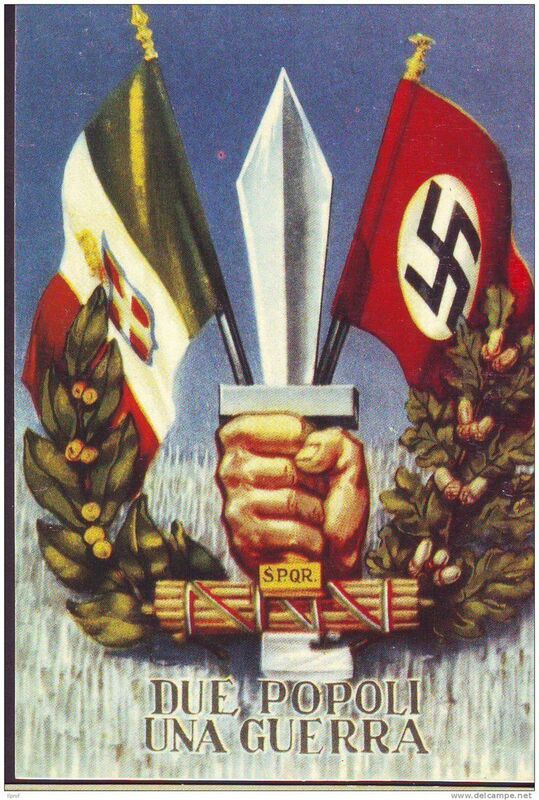 In Italy, for instance, the emphasis was on reinforcing the idea that the Germans and Italians were allies fighting together against barbaric (and Jewish) enemies. 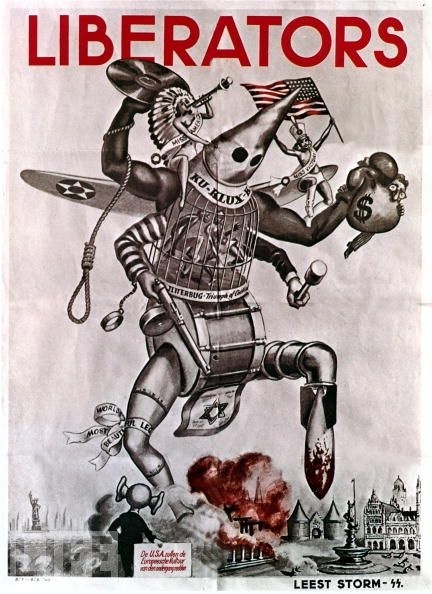 This poster combines outrage at Allied bombings with the old Goebbels stand-by, anti-Semitism. 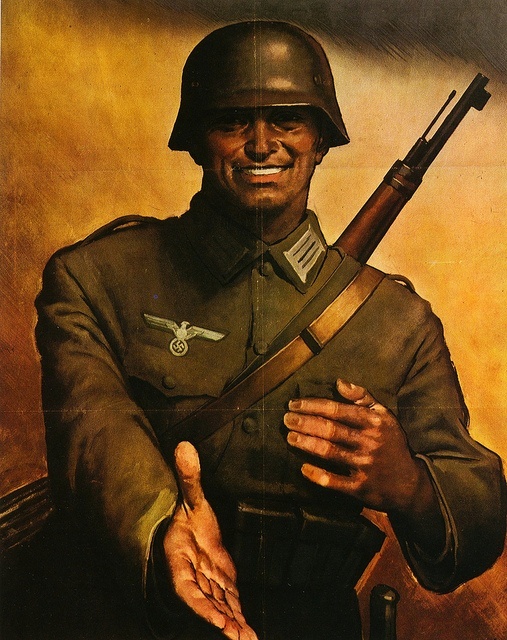 Thus, Goebbels created a lot of images of smiling Germans with outstretched hands and the like, conveying an image of both friendliness and underlying intimidation. 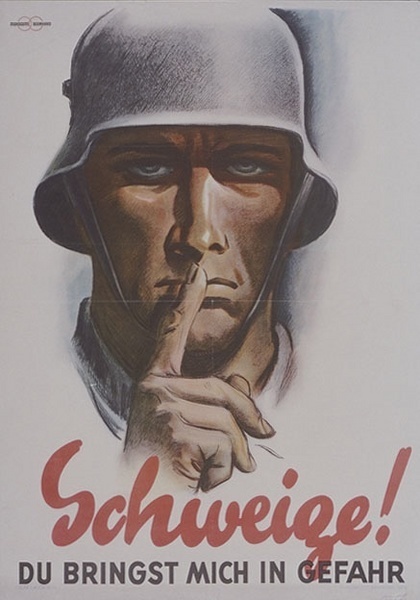 Standard propaganda themes used by all countries, such as not talking indiscreetly and thereby revealing secrets to spies, followed similar themes. 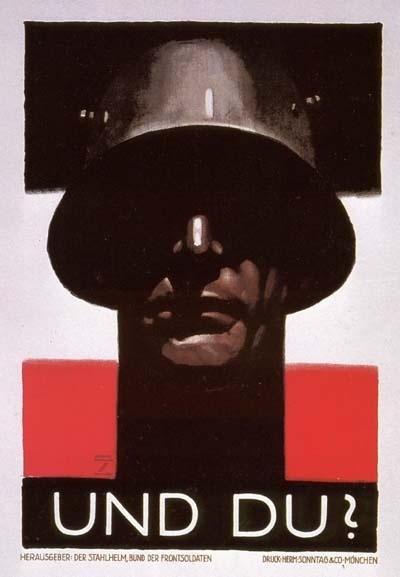 Whereas Allied propaganda on the same themes tended to play on the viewers' sense of patriotism and desire not to harm the soldiers, Goebbels' posters instead had an air of menace - as in, you had better do what we say, because if you don't, you won't like the consequences any more than we do. "Quiet! You put me in danger." The war began turning badly, and Goebbels compensated. 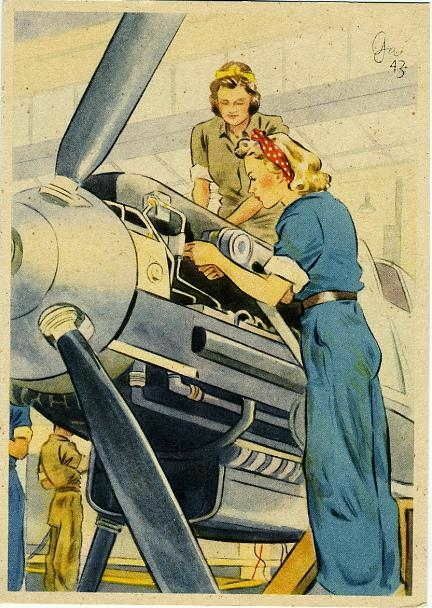 For instance, at first he created posters showing that Stalingrad was the victory destined to seal Germany's dominion over Europe. This was in keeping with repeated Hitler assurances that Stalingrad was going to fall any day, and that "nothing will ever make me leave there." However, Stalingrad of course was a disaster. 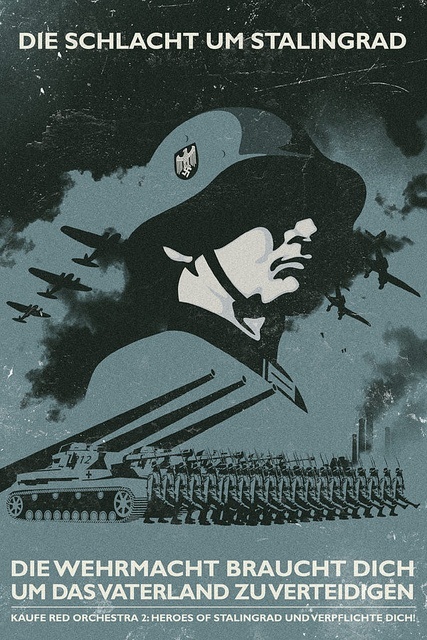 Goebbels pivoted and made it a rallying cry in his call for Total War in 1943 - an old idea from World War I, but one which became an effective rallying crying in the second, too. "The battle of Stalingrad. The military needs you to defend the homeland." 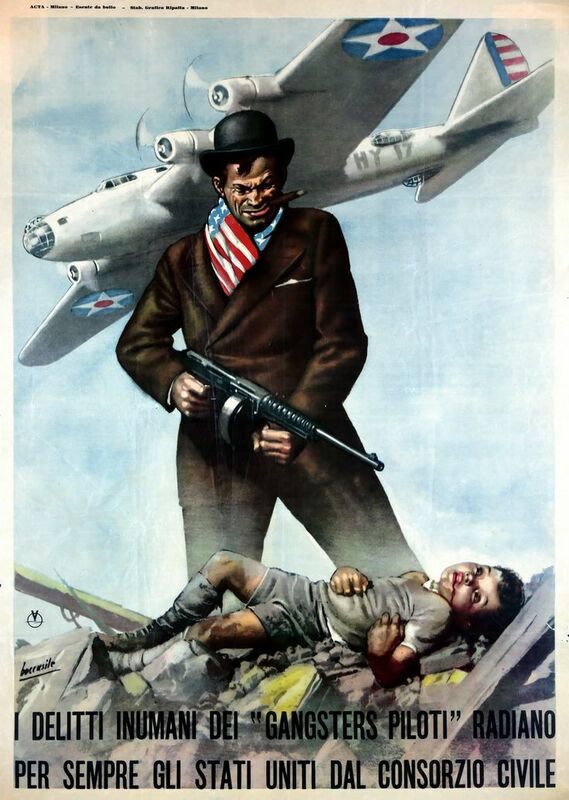 As the war turned sour, the propaganda became increasingly dark. 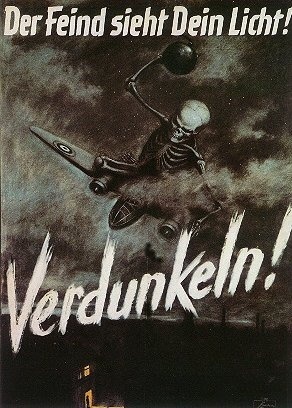 Instead of 1930s visions of young maidens holding flowers and the like, now there were pictures of skeletons flying Allied aircraft to rain death and destruction on Germany. Once again, the propaganda turned to fear and intimidation, playing on base impulses, rather than the more optimistic tone of Allied propaganda. "The enemy sees your light! Dim it!" 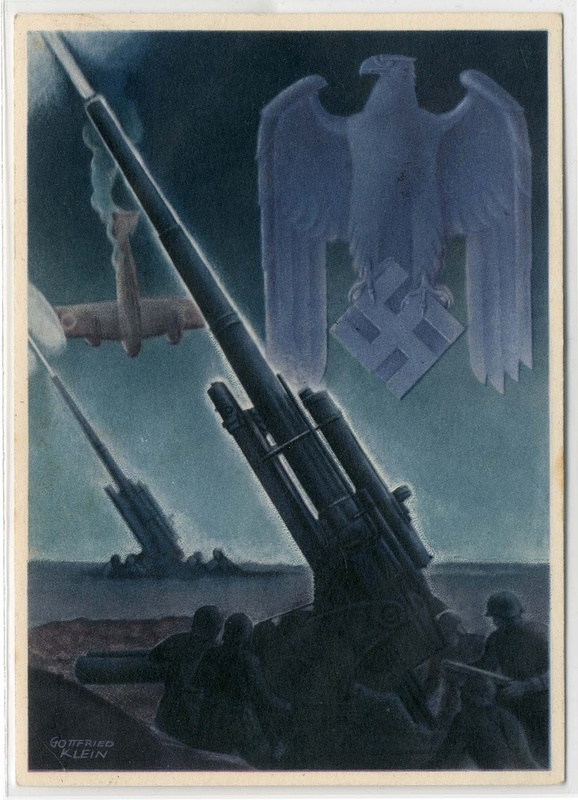 While it is easy to find fault with this German propaganda, one must admit that it somehow kept the German people fighting long after all hope for victory was lost. In that sense, it was a great success, even as it induced the German people to subject their homeland to death and destruction.